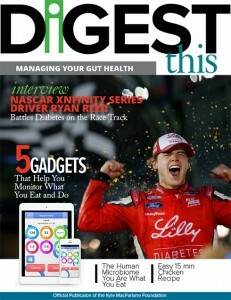 The Kyle MacFarlane foundation is preparing to publish its first issue of Digest This! Magazine, due in January 2018. Digest This! is the first digital publication of its kind dealing with digestive issues and how gut-health directly affects the mind and body. nity partners, to initially reach an estimated one million viewers. The digital format allows readers to view the magazine and embedded video from their mobile devices, laptops, and tablets. Subscribe Here, and get the first issue in your email inbox.